If you an occasional visitor to this blog you may well recognise Harry Abbott. Harry is another fishing nut and we have fished together quite a few times over the years, mainly here in Andalucía but more recently in the UK. It so happens that Harry is off adventuring in New Zealand as we speak and he has sent me a report of his adventures. I am hoping to reproduce it here on the blog over the next couple of days but, by way of a preamble, thought I might reproduce a little of what I wrote about him in my book “Dry River” which was published in the summer. It is worth repeating for the simple reason that some of Harry´s report makes reference to it. So, just before I include an account of Harry´s most recent adventures in his own words, here are a few about Harry in mine…..
“There is good fishing for black bass here in Andalucía and so, every now and again, Harry Abbott and I throw our float tubes and fly rods into the back of a car and head off bass fishing. A number of reservoirs lie within striking distance but our favourite, just a few kilometers inland of Marbella, and close to the town of Istán, is the Embalse de Concepción. There is a routine to our day: we meet up some place and throw our kit into one of the cars and travel together. The chances are we may not have met up for some time and have some news to catch up on. There are wives and kids to be accounted for and whatever events happen to be unfolding in the world at that time. Sooner or later, though, the talk will always turn to fishing. Harry has had the bug since he was a kid. 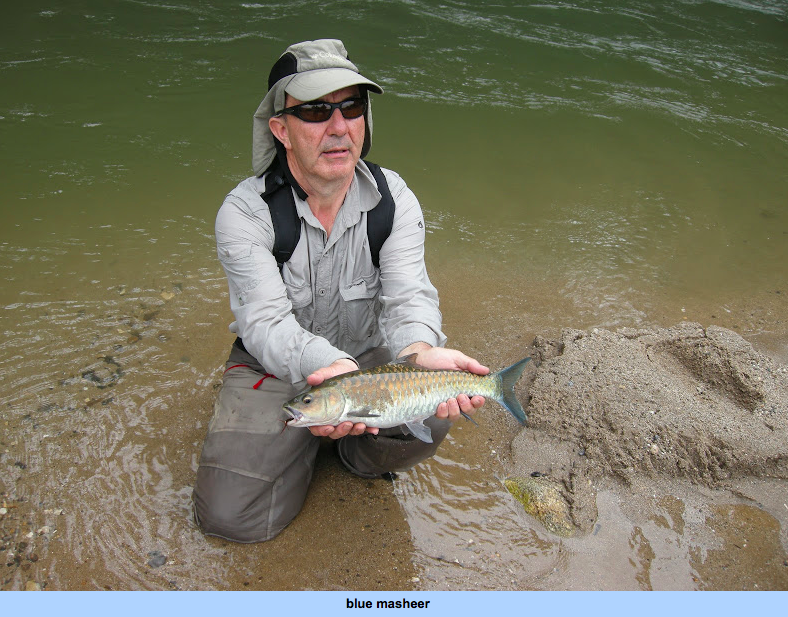 He has fished for salmon in the Kola Peninsula, for trout in New Zealand as well as Europe but, perhaps most interesting of all, for the blue and golden mahseer the remote jungle rivers of Thailand. On the road to Istán he will often talk of the jungle and of the villages where he stayed and the people who took care of him and guided him on the beautiful rivers where the mahseer could be taken, like trout, on an artificial fly. In places seen by few westerners he must have raised a few eyebrows among the locals. To people making a subsistence living in a riverside village, a middle aged man pursuing fish with a fly rod and a box of flies would seem, at best, distinctly odd, if not just plain crazy. Maybe he is crazy. Many men in his position, with some free time on their hands and not short of a few bob, are happy to prop up hotel bars or fuss over à la carte menus. But Harry is not among them. While his peers finish up the last of the peanuts, or eye up the drinks cabinet, I can picture Harry in my mind, out in the middle of nowhere, pushing his way through the undergrowth; a twenty first century Livingstone with a Sage rod in his hand. On the trip to Concepción he tells me about the things he doesn´t mention to his wife. He talks of the river crossings where fishermen and guides work together, arms linked, to prevent anyone who loses their footing being washed away downstream. These are rivers which should be respected and where several guides have memories of recent drownings. He has spoken also of the time that this might have been his own fate he when he could not free himself from the gripping mud in the intertidal reaches of New Zealand´s mighty Clutha River and realized the returning waters of the incoming tide would rise above his head. He was rescued in the end by a guide who heard his calls. Harry with one of the fly-caught masheer he caught in a remote jungle river in Thailand. At the moment he is off in New Zealand chasing trout.